China. 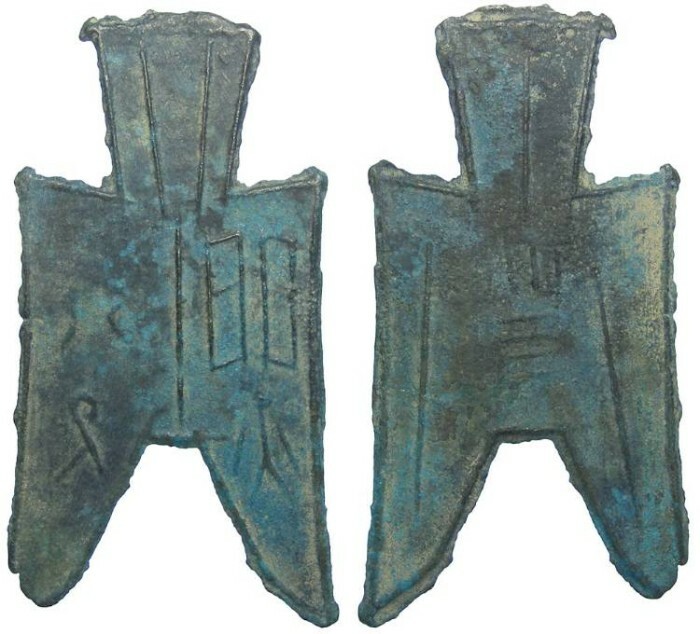 Zhou Dynasty. State of Zhao. Pointed foot spade. ca. 350 to 250 BC. 1/2 Jin. H. 3.97 variety. Mint : Lin was a city annexed by Zhao during the first 3/4 of the 4th century BC. Reference : H-3.97 variety. FD-138 variety. Size : 54.9 x 28.5 mm. Weight : 5.07 gram. Grade : VF but the tip of the left foot did not cast properly (it is a casting flaw, not broken). Obverse : "LIN BAN". Lin is the name of a city. Ban means 1/2 indicating a denomination of 1/2 Jin. Reverse : Besides the usual three lines all of these spades have, there 3 vertical and 4 horizontal lines indicating the number 34. Why some of these spades have numbers like this is not known.